PEMBROKE PARK, Fla. - Hey foodies. Get ready for a new show that is sure to melt the taste buds. 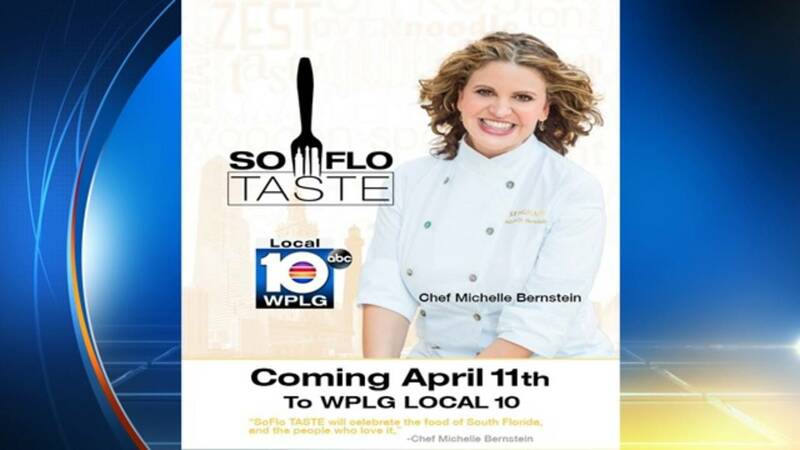 "SoFlo Taste" is a new, weekly show that will debut April 11 at 10:30 a.m. Hosted by South Florida mega chef and restauranteur Michelle Bernstein, the show "will celebrate the food of South Florida and the people who love it," she said. "We are extremely excited about our new show, SoFlo Taste, and equally excited South Florida's very own chef Michelle Bernstein is its chef and host," WPLG president Bert Medina said. "The teaming of WPLG and chef Bernstein will be like bringing two great ingredients together to make one exquisite dish." Bernstein is a Miami native who graduated with honors from Johnson & Wales University. She was the 2008 James Beard Foundation Award winner for "Best Chef South" and has three restaurants. "My food isn't heavy-handed or unnecessarily complicated," Bernstein said. "My style of cooking is based on the honest, soulful cooking I remember from my childhood." Bernstein said she was "thrilled to be part of South Florida's Saturday mornings." "I can't wait to whet everyone's appetites and fulfill the viewers need for cooking techniques, recipe ideas, local harvesting and ingredients and, of course, great flavors," Bernstein said. "We will pack a slew of useful and fun information in every 30-minute show and take viewers on kitchen and culinary tours they never thought existed."